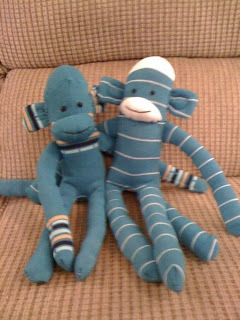 Meet Kaden and Colton's sock monkeys! These were created by a dear co-worker, Katrina. She started creating these for burn victims at a local hospital. When the children go back and forth for treatments they can take these little buddies for company. I asked that Katrina create one for Kaden and one for Colton and then identical ones to be given to a couple little boys who need a buddy. Hopefully, Kaden and Colton will cherish their sock monkey and realize that someone else has a matching monkey that helps get them through their days and will recognize at an early age what it means to give back. Thank you Katrina, these are precious! We had our 38 week appointment today and unfortunately there has been no change in our progression since last week but we knew that was a possibility. We did, however, schedule our induction date, so if Kaden doesn't come on his own in the next 12 days, we will force him out on the 31st. Our doctor offered to induce next week but that was like in 5 days, are we really ready for this. I figured a few more days wouldn't hurt anything! Grandma Earl said that tomorrow night (20th) is a NEW moon and that I need to stay close to the hospital because there is something about a new moon and babies being born. We could only be so lucky. We finally decided on a middle name but we are keeping it a secret until he decides to make an appearance. Check back for more updates over the next few weeks. We will post pictures as soon as we have any available. Well today is August 14th and we are about 2 1/2 weeks out and I was hoping Kaden might want to make an appearance today. Today is Grandpa Hartley's birthday and if he was born today, we were going to name him Kaden Milo after grandpa since his middle name is Milo. But Kaden is letting us all know that he is the boss and we are on his schedule now!! About a month ago, I went back to FXStudios, they did our wedding pictures, and had some belly pictures done to document the past nine months. We plan on taking a few of these and hanging them above his crib and adding his newborn pictures as soon as we get them done. We are very anxious for the next couple of weeks and really look forward to meeting Kaden. We will try to update this over the next few weeks with any type of change in his arrival. As of now we have a little bit of progress but we all know we could be at this point for multiple weeks. Kaden is due September 1st and if he doesn't come on his own before then, he is coming out on the 2nd! Looking forward to sharing him with each of you!! Well, we are anxiously awaiting Kaden's arrival. We have everything ready to go, at least we feel like we have everything ready. I guess that isn't completely true, we are having a very had time figuring out a middle name for the little tyke!! I have a few picked out which I like but Dad isn't liking them...who will win this one!?!? We had our birthing class on Sunday and learned a LOT, not to mention saw a few things we could have lived without! And lucky for us we live 2 blocks, both right hand turns, from the hospital so getting there shouldn't be an issue. 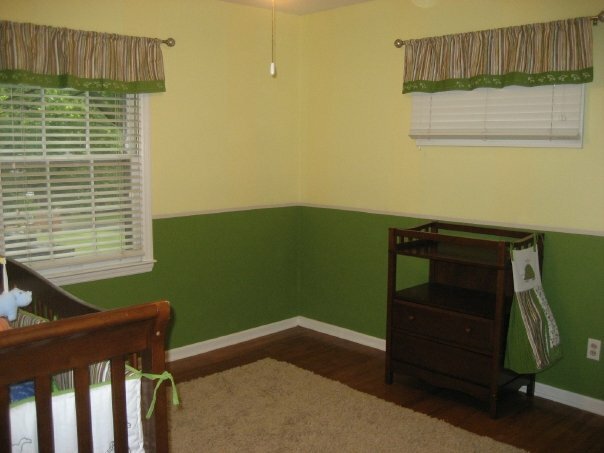 My mom and Justin's mom came over a few weeks back and worked all weekend long on the little guy's room while I supervised! They did a great job and it surpassed my expectations. 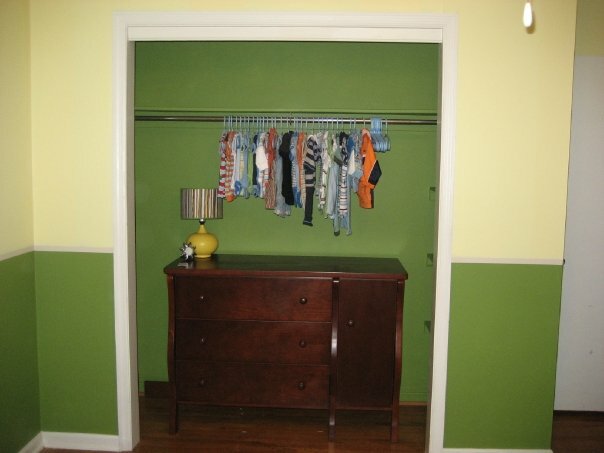 Uncle Adam came over last week and added the chair rail around the room (not pictured-but will post soon). We hope all is well for everyone and we look forward to introducing you to our little monkey!